Happy 2018! I’m back from a few days in the stunning big-sky big-earth desert/mountain landscape of Big Bend National Park, with a brief boat-and-burro-ride into Boquillas, Mexico. Nature sure helps put my monkey-mind concerns into perspective. Hikes, hot springs, camp food, company, solitude, and nourishing views, views, views. Yesterday this blog got 580 views. Today so far there have been 380. Most days I get a lot fewer views. The average number of views per day in November was 109. I have no idea why views spike like this. I can see that 120 views today were referred by links, including search engines, but that doesn’t explain 260 of the views. I can also see on the site stats that my home page, The Well Ashiatsu and Massage, has been viewed 239 times today so far. When Intuition Is A Curse. When people come into my office and tell me, very early in a conversation, that they are ‘intuitive’ and ‘can see into people’ I often wonder if they have had trauma. The longer I do this for a living the more I realize that some of us developed our insights into humanity as a protection mechanism. It makes sense. People who have experienced trauma tend to be more intuitive. We’ve experienced hypervigilance where we are constantly scanning our environments for signs of danger. Have you experienced trauma, and are you intuitive, psychic, an empath, and/or clairvoyant? I’m curious. This article reminded me that early this year, I witnessed some microexpressions, when emotions that someone is trying to suppress appear briefly on their face. Paul Ekman has done a lot of research into them. The TV show Lie To Me is based on his work. Reading them may have a lot to do with intuition. I noticed hatred and contempt appear fleetingly behind a mask of apparent calm and reason on the face of a man I had dated for a couple of months as he spoke to me. He was unaware of them or that I could read them. It was disturbing. I could not think of anything I had done to merit those emotions, and I felt hurt and puzzled. From that and other puzzling oddities, I suspected he’d been emotionally abused. He hadn’t mentioned it to me, but his behavior had been strange at times. A mutual friend confirmed years of past abuse. Apparently I had unknowingly done something that triggered his memories of being abused. After learning of the history of abuse, I felt compassion for him. I also realized I didn’t want to be alone with him in private again. Later he got his wires crossed again, in public, right in front of me. Curious (because he still hadn’t told me anything about the abuse), I then had a clairvoyant experience in which I “saw” that he’d been the subject of horrific psychotic rage repeatedly for years. I had a major fight-or-flight reaction. I rode it out with mindfulness as much as I could. Once the biochemical cascade was underway, there was not much to do but wait for it to fully subside and do what I could to recover my equilibrium. It took a few months for that to happen. I watched my fearful, self-protective mind at work, influenced by deep stress. It wasn’t pretty, and I’m glad it’s over. Although unpleasant and difficult, being able to witness my own experience was useful. I learned a lot from this. A main take-away is that if I am relating to someone who’s been traumatized, I want them to be up-front about it pretty quickly, if they have any awareness of it at all. It leaks out anyway if they try to hide it, and they come across as untrustworthy. Over 60 percent of Americans experience trauma at least once in their lives. It’s not that uncommon. I gained compassion for my past traumatized self, before I had done any healing work. I didn’t know myself well enough to understand how much trauma had shaped me. During that time of riding out the biochemical cascade, I was diagnosed with adrenal fatigue. I am grateful for the healers who helped me recover, including the healer inside me. I felt compassion for him. He was admittedly clueless, dissociated, and good at compartmentalizing. In my opinion, he seriously needed professional help. I grokked his disappointment at leaving an abuser with hopes for a better future, waiting six months after divorcing and taking a course on building new relationships before dating, only to discover that the abuse had made him both easily disturbed by those with positive intentions and disturbing to them. It was sobering to refer someone I dated to therapy. In hindsight, I think I showed him how a fairly healthy person responds when they are dating or befriending someone who shows signs and symptoms of mental illness, who is either hiding it, discounting its seriousness, or so injured he doesn’t even know he has a mental illness. I let him know that I knew, told him that I would not have dated him had I known, and I ended our relationship until such time as he has recovered, urging him to get professional help to that end. It seems probable that he needed to know how someone would do this. But damn, that was really freaky. May his cluelessness become curiosity. May his compartmentalization become wholeness and expansion. May his fears become worthy of reconditioning. May his dissociation occur only when useful, and may he learn to live in partnership with his body. May his awareness include an appreciation of the gifts of the unconscious mind and a more conscious partnership with it. May his contempt, hatred, terror, shame, and secrecy be transformed and his burden be lessened. And after I think of him and send energetic blessings his way, I dissolve all thoughts and images of him and bring my attention back to my own body and experience peace and gratitude. But was my intuition working because I’ve experienced trauma myself and learned to be observant? I don’t know. Here’s a possibility: Apparently some long-time meditators are also adept at reading microexpressions. From studies with thousands of people, Ekman knew that people who do better at recognizing these subtle emotions are more open to new experience, more interested and more curious about things in general. They are also conscientious — reliable and efficient. “So I had expected that many years of meditative experience” — which requires both openness and conscientiousness — “might make them do better on this ability,” Ekman explains. Thus he had wondered if Öser might be better able to identify these ultra-fast emotions than other people are. Then Ekman announced his results: both Öser and another advanced Western meditator Ekman had been able to test were two standard deviations above the norm in recognizing these super-quick facial signals of emotion, albeit the two subjects differed in the emotions they were best at perceiving. They both scored far higher than any of the five thousand other people tested. “They do better than policemen, lawyers, psychiatrists, customs officials, judges — even Secret Service agents,” the group that had previously distinguished itself as most accurate. “It appears that one benefit of some part of the life paths these two have followed is becoming more aware of these subtle signs of how other people feel,” Ekman notes. Öser had super-acuity for the fleeting signs of fear, contempt and anger. The other meditator — a Westerner who, like Öser, had done a total of two to three years in solitary retreats in the Tibetan tradition — was similarly outstanding, though on a different range of emotions: happiness, sadness, disgust and, like Öser, anger. I’m not nearly as experienced at meditation as these men, but even at my level, meditation can slow the experience of time down until there is only the present moment, which becomes vast, and awareness simply expands. If you can experience time like that, microexpressions would be much more apparent. That’s one explanation. Or maybe I’ve just been around the block a few times. Or maybe these long-time meditators had also trauma in their histories. The article didn’t say. I do know that for years, I’ve been interested in people-reading, and I imagine at some point early on, there was a connection in discerning whether they were safe to be around. But once you realize someone is not out to murder you, there’s still a lot to learn. We humans are pretty fascinating and diverse. If you want to learn more about reading microexpressions, Paul Ekman (link above) has a newsletter and online training. Become a living question for Halloween! Try this: Sit in an upright posture. Chair, zafu, floor, doesn’t matter. Spine straight but not rigid. Breathe. Get yourself centered. Ask very slowly and don’t expect an answer, but really, really listen. Several people whom I follow on Twitter linked to this post, Does it hurt? Yes. Is that a problem? No. Read it if you’ve ever wondered about the difference between pain and suffering. They’re not the same. The title kind of gives it away, but it’s well worth reading anyway. Pain is inevitable because you have a nervous system. Pain is a form of communication. It lets us know to stop doing whatever caused it (if it is in our control — some pain is not), to seek safety, care, rest, healing. Suffering comes from pain plus resistance. It’s the resistance to pain that causes suffering. If we could just surrender to pain, just let it wash through our awareness without judgment, it would leave more quickly. Last year when I was just a couple of months into my practice of meditating for 30 minutes every day, my body hurt every time I sat. I kept expecting it to go away. 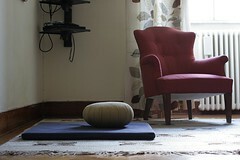 My suffering was due to my belief that a sitting practice shouldn’t hurt. When I checked in with my teacher, Peg Syverson, she said that pain is part of sitting. Every meditator faces this issue sooner or later. Once I understood that pain was part of my body’s adaptation to the posture and that I might always experience some pain each time I sat, an odd thing happened. Or perhaps a natural and normal thing happened. My body stopped hurting when I sat. The pain and the suffering both just left. Interestingly, I’ve heard others’ stories about that: that the older you are, the more quickly your body adapts to sitting and the sooner you can sit without pain. I suspect that in some cases, the opposite may be true. Habituation has a lot to do with it. Any new, prolonged activity that uses muscles differently than how you usually use them results in discomfort or pain. Now it may be easier to do this with minor pain than major, but next time you feel some pain, get curious about it. Breathe slowly and deeply to relax, and feel it. Exactly where is it? Does it have a sharp boundary, or is it diffuse? What is the quality of the pain: is it dull, piercing, throbbing, steady, deep, shallow? How long does it last? You may not feel joy, but you can rejoice in the fact that you can feel pain.